I like Design #3 the best. Really creative use of positioning the human body. I wonder how tall it would be? â€œDancing on the Stairsâ€ by Kendra Fleischman shows a lot of movement just by looking at it. So my choices are dancing blue people, a rainbow broccoli stalk or a blocky yoga woman? Um… I’ll go with #1, the dancing blue people. Seems to fit the “arts center” image. But… how about a big blue bear looking in the window? Has anybody thought of that?! I like the dream tree by kalish. The theme fits in with the organic vine like design on the outside of the blue building. Thanks. I like #1 as it encompasses action in many stages and that is what the Center reminds me of when I pass by or go to an event. I also wonder about the scale of these pieces. I like #2 the best. It is dramatic and mystical. I don’t care for #1- I feel like it is what you would expect and a bit cliche- maybe if it were executed better it would hold more appeal. #3 is interesting but the blockiness is a bit off putting. Design # 3 is beautiful and very unique! I love the “all encompassing” Dream Tree. It conveys an umbrella fstage for all art forms. All 3 of the final designs are excellent and would be good choices for the new plaza. My favorite is #1, Dancing on the Stairs. It’s lively, joyful, colorful and seems reflective of the arts (dance, music, and the visual arts)–everything the Arvada Center is all about. I think children, especially, will relate to this piece and will dance on the stairs too, so I hope it will be placed and executed in a way that viewers can join the figures. My second favorite design is #2, the Dream Tree. The colors are lovely and it does have a mystical quality, but will you see the tree-top colors from below? Will it also become just “one more tree” on the plaza with the other landscaping? 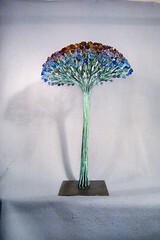 How this “broccoli tree” is perceived depends on how large the final sculpture is and how it is lighted at night, which could make or break this piece. Good job to all the artists and to the selection committee. I vote for Dream Tree. As several people mention in their comments, more information about the size, the context etc. for these sculptures would have helped in the decision process. I vote for Finalist #1, “Dancing on the Stairs” by Kendra Fleischman. This work displays what the Arvada Center has consistently provided the art loving community: movement, energy and talent. 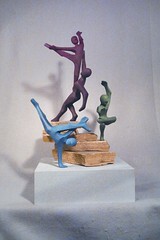 A creative and wonderful signature piece, which not only portrays dancing on stairs, but also reaching for the stars! I am voting for Design #1 I like the idea of the people moving. My preference is #3, with #1 a close second . I love #3. Beautiful and artistic. I like that it’s a bit out of the ordinary. I hope it’s big! 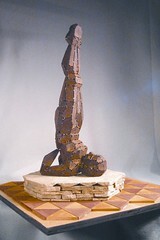 I like the piece by Golden artist Kendra Fleischman, ” Dancing on the Stairs”. It shows movement, color and layers which are not present in the other 2 works. I did like the comment made about the giant blue bear looking in the window, very cleaver. All pieces have their own unique appeal but I vote for #1. I like #2 because it is something I have never seen before. I love colors. I definetely vote for the dream tree, #2. It beats the others in beauty. Hands down, love the “Dream Tree.” Within that work is all the color, symbolism and dynamic that each of the cultural art disciplines can find commonality.